And the execution was pretty good, save for some obvious trouble areas like getting the ghetto in Frost Cave post-dash. Frost cave auto-loads and you end up waiting at the door so no time was lost there. [quote="Jack879"]And the execution was pretty good, save for some obvious trouble areas like getting the ghetto in Frost Cave post-dash. [/quote] Frost cave auto-loads and you end up waiting at the door so no time was lost there. The earlier you get there, then the stronger your boost charge can be. It's slight, but it is something to consider. [quote="T3"][quote="Jack879"]And the execution was pretty good, save for some obvious trouble areas like getting the ghetto in Frost Cave post-dash. [/quote] Frost cave auto-loads and you end up waiting at the door so no time was lost there. [/quote] The earlier you get there, then the stronger your boost charge can be. It's slight, but it is something to consider. Ideally yes. However, boosting through the door with a weak boost produces a consistently good boost path (as seen in the segment). That has more to do with the angle of the analog stick than the speed of the boost. And in the video Justin even hits the door frame which is what pauses him just enough for the camera to catch up and provide a clear path to leaving. A mistake to me is more than just what goes wrong but the thought process of analyzing everything improvable as mistakes. Great segment! That invisible drone strat is slick. Got pretty bad RNG, but I would rather have a run with good, solid movement and bad RNG than a run with mediocre movement and good RNG. I can make up for it in the next segment. This is the best Metroid Prime I have played in my life. 1,106 attempts. I had a feeling you were going to get S11 down last night! You were playing so good despite losing a lot of your attempts to the SW and to the Metroid dash. It was heartbreaking stuff but I'm glad you persevered. What a segment. That wallcrawl was so fast! I had a feeling you were going to get S11 down last night! You were playing so good despite losing a lot of your attempts to the SW and to the Metroid dash. It was heartbreaking stuff but I'm glad you persevered. What a segment. That wallcrawl was so fast! i just want to say this looks awesome, and i look forward to watching the whole thing when you're done go go go! Segment 10: The boost into the elevator room is pretty hard to do well, but since this is 15 squares I bet you just were forced to take it. Same with the lack of IU for PPC, since it's slower than jumping down from Df's timings. And the same goes for failing the platform boost in Omega Research compared to using dashes to fall more quickly. But, you and I both know that luck (and damn good luck at that) matters much more in this segment. Very nice invis drone strat, using df's dash along with a SJ dash to lure it over and a missile so you can morph sooner (and in SS, beam swap before morphing if you have three hands.) Smart. Kind of a meh end with the jump into the save but you can bonk your head so easily so I understand the nerves after 15 squares. Segment 11: Not collecting drops at all is rather ballsy. It's too bad you didn't get the IU after box bomb but that's...hard. I'm glad you were able to incorporate a new strat into MQA after so long. I often bunnyhopped off that platform but never thought to start a dash from before that room. When I return I hope I can get that down, it's slick. And the second dash to the door must be very hard or we were all silly for missing such an obvious trick. That should save a lot of setup time. I'm curious if it's better to morph from further away after shooting the door, so you can boost into the bump then afterwards. Rolling seems...pretty slow there. Same with the SJ after the first dash in FHA. Probably nerves because of how crazy the earlier portion just was and what the segment is about to become. Edit: Justin reminded me of glider cycle so it doesn't matter if there's slop so long as you make it. ENB was, well, incredible. Same with the boosting through half of FHB. Pretty awesome. And a good way to get to the save room load trigger! I'm glad somebody found a way better method than I had. Pretty awesome and stressful segment I bet, not just the movement but the drop luck is absolute torture. It forced me to take a bad one, but "ok" luck and amazing movement is always much prettier. I'm glad you're finishing these up and they're looking great. Keep up the good work and good luck. Segment 10: The boost into the elevator room is pretty hard to do well, but since this is 15 squares I bet you just were forced to take it. Same with the lack of IU for PPC, since it's slower than jumping down from Df's timings. And the same goes for failing the platform boost in Omega Research compared to using dashes to fall more quickly. But, you and I both know that luck (and damn good luck at that) matters much more in this segment. Very nice invis drone strat, using df's dash along with a SJ dash to lure it over and a missile so you can morph sooner (and in SS, beam swap before morphing if you have three hands.) Smart. Kind of a meh end with the jump into the save but you can bonk your head so easily so I understand the nerves after 15 squares. Segment 11: Not collecting drops at all is rather ballsy. It's too bad you didn't get the IU after box bomb but that's...hard. I'm glad you were able to incorporate a new strat into MQA after so long. I often bunnyhopped off that platform but never thought to start a dash from before that room. When I return I hope I can get that down, it's slick. And the second dash to the door must be very hard or we were all silly for missing such an obvious trick. That should save a lot of setup time. I'm curious if it's better to morph from further away after shooting the door, so you can boost into the bump then afterwards. Rolling seems...pretty slow there. Same with the SJ after the first dash in FHA. Probably nerves because of how crazy the earlier portion just was and what the segment is about to become. Edit: Justin reminded me of glider cycle so it doesn't matter if there's slop so long as you make it. ENB was, well, incredible. Same with the boosting through half of FHB. Pretty awesome. And a good way to get to the save room load trigger! I'm glad somebody found a way better method than I had. Pretty awesome and stressful segment I bet, not just the movement but the drop luck is absolute torture. It forced me to take a bad one, but "ok" luck and amazing movement is always much prettier. I'm glad you're finishing these up and they're looking great. Keep up the good work and good luck. A bittersweet end to one of the greatest achievements in my career speedrunning Metroid Prime. 0:49. It seemed so far away at one point. But now, as I type this staring at the mission final on my TV, I realize that sub-50 is the new reality for this game. Why bittersweet? The last three segments of this run are rough completions, even leaving out Exo skip. It hurts to finish the run on such a sour note after pouring so much of my time and effort dedicated to creating the greatest product possible. This does not go without reason, however. Recently, real life has taken over and I will be gone from speedrunning for (most likely) over a year. I figured it was more important to provide the community, and myself, with a sense of closure of this run instead of leaving all of my hard work to the imagination...what could have been. There is a slim possibility that I will come back to re-do the last three segments to create the run that I dreamed of, but I do not know if my situation will allow for that. I wanted to make it very clear that this run matters a lot to me. I was not giving in to the instant gratification demon that lives in us all. Thanks for reading, and thank you for all of those who helped in the making of this run. I will not be posting these final three segments as I feel it would taint the current quality of the run even further. 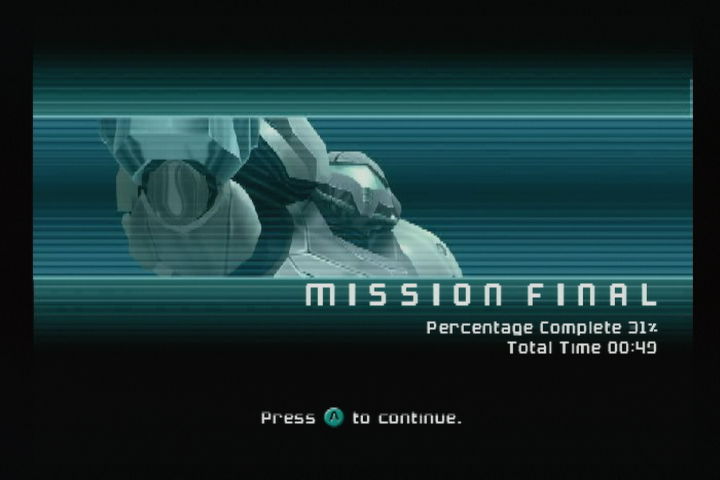 [img]https://i.imgur.com/IgXBz7l.png[/img] A bittersweet end to one of the greatest achievements in my career speedrunning Metroid Prime. 0:49. It seemed so far away at one point. But now, as I type this staring at the mission final on my TV, I realize that sub-50 is the new reality for this game. Why bittersweet? The last three segments of this run are rough completions, even leaving out Exo skip. It hurts to finish the run on such a sour note after pouring so much of my time and effort dedicated to creating the greatest product possible. This does not go without reason, however. Recently, real life has taken over and I will be gone from speedrunning for (most likely) over a year. I figured it was more important to provide the community, and myself, with a sense of closure of this run instead of leaving all of my hard work to the imagination...what could have been. There is a slim possibility that I will come back to re-do the last three segments to create the run that I dreamed of, but I do not know if my situation will allow for that. I wanted to make it very clear that this run matters a lot to me. I was not giving in to the instant gratification demon that lives in us all. Thanks for reading, and thank you for all of those who helped in the making of this run. Special Thanks to: T3, Metroid177, Jack879 I will not be posting these final three segments as I feel it would taint the current quality of the run even further. I want to preface by saying that segmented runs are no small feat, despite the momentary glance of it being easier because of saves. The first sub 50 is real. Even though you might not have finished the way you wanted, you still have it. It's yours (and ours in a way), my dude. I've said before a few times to others as well, and I'm sure you know since you're the only dude to really go at Segments like me: Finishing well is the hardest task because you want to be done with the project. I hope that your IRL situation improves so that you will have time for more Prime, perhaps the slim hope of polishing off 12/13/14 (Hold onto those saves, young man). Congratulations on all the hard work. I won't forget the prior segments if you never return to this task. I want to preface by saying that segmented runs are no small feat, despite the momentary glance of it being easier because of saves. The first sub 50 is real. Even though you might not have finished the way you wanted, you still have it. It's yours (and ours in a way), my dude. I've said before a few times to others as well, and I'm sure you know since you're the only dude to really go at Segments like me: Finishing well is the hardest task because you want to be done with the project. I hope that your IRL situation improves so that you will have time for more Prime, perhaps the slim hope of polishing off 12/13/14 (Hold onto those saves, young man). Congratulations on all the hard work. I won't forget the prior segments if you never return to this task. I think it would be really cool if other top runners contributed to the post segment 11 stuff to make 47 a reality, would be a really neat victory for the Prime community in my opinion. Justin, this is incredible work and I hope you're really proud of this! I've watched a few of your completed segments and they are completely bonkers to say the least. Your segment 11 is one of the most insane bits of Prime execution I've ever seen. I think it would be really cool if other top runners contributed to the post segment 11 stuff to make 47 a reality, would be a really neat victory for the Prime community in my opinion. Justin, this is incredible work and I hope you're really proud of this! I've watched a few of your completed segments and they are completely bonkers to say the least. Your segment 11 is one of the most insane bits of Prime execution I've ever seen. this is a shame, but sometimes you just have to stop running. I know this from bitter experience. Good job finishing it off even if it wasn't optimised how you would have liked. a prime run like this -- with different runners playing different segments -- was actually attempted many years ago, but never finished. There is a very-well-travelled GameCube memory card out there somewhere. this is a shame, but sometimes you just have to stop running. I know this from bitter experience. Good job finishing it off even if it wasn't optimised how you would have liked. [quote="BashPrime"]I think it would be really cool if other top runners contributed to the post segment 11 stuff to make 47 a reality, would be a really neat victory for the Prime community in my opinion. [/quote] a prime run like this -- with different runners playing different segments -- was actually attempted many years ago, but never finished. There is a very-well-travelled GameCube memory card out there somewhere. Incredible scenes. The new Holy Grail reached (with room for improvement too). Any links available for the first 11 segments at least? And the best of luck with your future path. We all have to move on for different reasons (I certainly had mine). Take care of yourself and well-done again for the world's first sub-50 MP run. Incredible scenes. The new Holy Grail reached (with room for improvement too). Any links available for the first 11 segments at least? And the best of luck with your future path. We all have to move on for different reasons (I certainly had mine). Take care of yourself and well-done again for the world's first sub-50 MP run. Here is a link to the playlist of Segment 1-11. Rough segments 12-14 are on there (but private) as well simply for posterity. Here is a link to the playlist of Segment 1-11. Rough segments 12-14 are on there (but private) as well simply for posterity. https://www.youtube.com/playlist?list=PLxePOLCPdhSj9qXEOcPPgBz3i1JeqKzzu Thank you for the kind words, everyone. Congrats first sub 50 minutes. When i see your first 11 segments i was really impressed. These segments was done so well. But why you going make three last segments so crap? I think segment 12 was somewhat avarage one, because its long and hard segment. But there is definitely no any reason make crap Ridley and Prime fight what you did. I will really hope you not are happy with this and have your memorycard and back work segments 12, 13 & 14 again. Ridley fight only look you did 20-30 seconds time lost when you totally mess up that fly phase skip and thats still includes one waste attack in ground phase. Also totally mess up Prime 2 pool fight and i think Prime first form can be redo too. In my opinion, your have to back redo that run yet (just three last segments only). Its can´t be ended like this. You can hit at least low 48 minutes and probably high 47 minutes depend how high 49 minutes this are. Keep just trying, I´ll really hope you have memory cards save beforer segment 12. You did absolutely great job make all first 11 segments. But great run like this can´t end like this. Last three segments was so rough and sorrowful looking. Congrats first sub 50 minutes. When i see your first 11 segments i was really impressed. These segments was done so well. But why you going make three last segments so crap? I think segment 12 was somewhat avarage one, because its long and hard segment. But there is definitely no any reason make crap Ridley and Prime fight what you did. I will really hope you not are happy with this and have your memorycard and back work segments 12, 13 & 14 again. Ridley fight only look you did 20-30 seconds time lost when you totally mess up that fly phase skip and thats still includes one waste attack in ground phase. Also totally mess up Prime 2 pool fight and i think Prime first form can be redo too. In my opinion, your have to back redo that run yet (just three last segments only). Its can´t be ended like this. You can hit at least low 48 minutes and probably high 47 minutes depend how high 49 minutes this are. Keep just trying, I´ll really hope you have memory cards save beforer segment 12. You did absolutely great job make all first 11 segments. But great run like this can´t end like this. Last three segments was so rough and sorrowful looking. geez dude don't you think that's kinda harsh? He already explained the reason why he kept these segments, he is dealing with irl stuff and had factors outside his control preventing him from spending as much time on it as he wanted to. [quote="MASTER-88"]Congrats first sub 50 minutes. When i see your first 11 segments i was really impressed. These segments was done so well. But why you going make three last segments so crap? I think segment 12 was somewhat avarage one, because its long and hard segment. But there is definitely no any reason make crap Ridley and Prime fight what you did. I will really hope you not are happy with this and have your memorycard and back work segments 12, 13 & 14 again. Ridley fight only look you did 20-30 seconds time lost when you totally mess up that fly phase skip and thats still includes one waste attack in ground phase. Also totally mess up Prime 2 pool fight and i think Prime first form can be redo too. In my opinion, your have to back redo that run yet (just three last segments only). Its can´t be ended like this. You can hit at least low 48 minutes and probably high 47 minutes depend how high 49 minutes this are. Keep just trying, I´ll really hope you have memory cards save beforer segment 12. You did absolutely great job make all first 11 segments. But great run like this can´t end like this. Last three segments was so rough and sorrowful looking. [/quote] geez dude don't you think that's kinda harsh? He already explained the reason why he kept these segments, he is dealing with irl stuff and had factors outside his control preventing him from spending as much time on it as he wanted to. They're placeholder segments, I didn't really "keep" them, per se. Oh my gosh it's Master-88! Justin has everything up to segment 11 (the last optimized segment) saved. The last three segments are rough because Justin wanted to at least finish a sub-50 run and release it to the public before his personal life stuff takes up all his time. Oh my gosh it's Master-88! Justin has everything up to segment 11 (the last optimized segment) saved. The last three segments are rough because Justin wanted to at least finish a sub-50 run and release it to the public before his personal life stuff takes up all his time.